In this Feb. 15, 2018, file photo the Toyota logo is displayed at the Pittsburgh Auto Show. 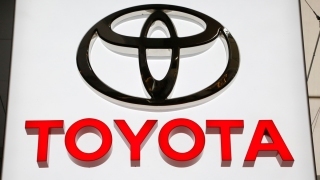 Toyota is recalling 1.7 million vehicles in North America to replace potentially deadly Takata front passenger air bag inflators. The move announced Wednesday, Jan. 9, 2019, includes 1.3 million vehicles in the U.S. and is part of the largest series of automotive recalls in the nation’s history.